At the start of the year, Enviro Grind Ltd. took possession of a stunning brand-new Scania R580 6x2 tag-axle from McElvaney Motors. We dropped into the company’s Pettigo, County Donegal base and caught up with managing director Martin Eves and fleet manager Christopher Eves to find out more. Added to the fleet in the second week of January, Enviro Grind’s new Scania looks truly spectacular in the company’s striking white and green livery. “It’s a fantastic truck, very comfortable, and we are delighted with it,” says Christopher. “We had to make a choice between a new one and a good used one but decided that the new lorry made better sense. We wanted to reduce fuel costs and the price difference between new and used wasn’t enough to send us into the second-hand market. “Everything pointed to new. We had purchased a new trailer and we wanted a really good rig on the front of it. From the point of view of driver comfort and fuel economy, we couldn’t be happier.” The fact that the truck looks amazing is a welcome added bonus and it’s certainly attracting plenty of admiring glances as it goes about its work on the roads of Ireland and Scotland. The new acquisition brings the current fleet size to three units (2 Scania & 1 Volvo) and two Scania rigids. 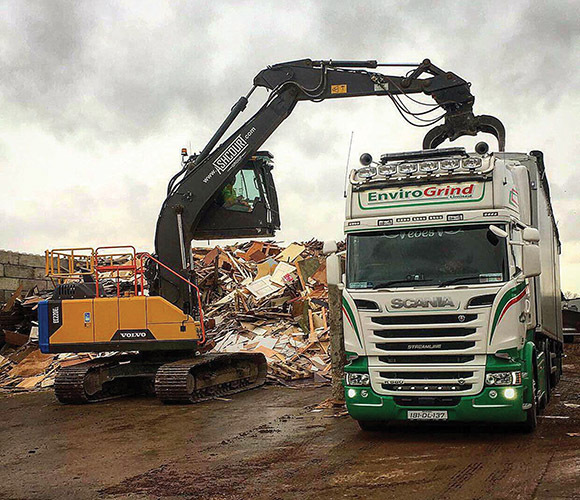 There’s plenty of work for the fleet – as well as carrying out their own collections and deliveries, Enviro Grind also do some contract work for other waste companies so there’s a real possibility that further vehicles will be required sooner rather than later. Operating out of South Donegal, Enviro Grind Ltd. doubles up as a fully-licenced, -permitted and –approved waste recycling company and a key supplier of horticultural products. With over 20 years’ experience in the processing and horticultural industries, in both Europe and the United States, EnviroGrind offers its customers environmentally-friendly products and efficient services. Services provided - with solutions tailored to customer needs - include composting of organic waste; waste wood processing; green waste processing; gypsum waste processing; specialist grinding / shredding; garden and home supplies; collection & delivery and bulk haulage. Established by Martin in 1997 as a mobile wood grinding and screening business, Enviro Grind opened its Pettigo site in 1998 to recycle wood and green / garden waste. After building an in-vessel composting plant in 2005, EnviroGrind became one of the first composting facilities in Ireland to receive Animal By-Product (ABP) approval from the Department of Agriculture, Food and the Marine. In 2004, after two years of R&D, Enviro Grind installed its first Gypsum Recycling System at Gyproc & Isover Ireland (formerly Gypsum Industries) in Kingscourt, County Cavan. Enviro Grind continues to own and operate this plant to date. Martin went on to form Envirogyp Recycling Systems (EGRS) Ltd. in 2006 to design and supply bespoke Gypsum / Plasterboard Recycling Systems to the worldwide market. EGRS systems are now operational in Ireland, Australia, Switzerland, France and Germany. Daily operations within Enviro Grind are managed by Martin’s son, Kevin, while the company founder continues to focus on R&D into screening and processing traditionally difficult waste streams as well as the design and supply of Gypsum Recycling Systems. On the back of these efforts, a new business called Dynamic Screening Systems will be launched this spring / summer, developing high-energy industrial screening machines for the quarrying and recycling sectors. “If the screening systems take off as I’m hoping they will, then there will be more low-loader work and more machinery parts to be moved and we will expand the fleet accordingly,” the MD confirms. How difficult is it to strike the perfect balance between providing a great service and also making sufficient profit? “Regardless of what business you are running, you have to tune things so that you have high degrees of efficiency,” the Donegal man says. “You must be very capable of reacting to any changes in the market and, wherever possible, you need to be opportunistic in your thinking. Looking to the future, Martin is optimistic that – with a stunning new Scania on board - EnviroGrind is in good hands: “I’ve four sons and a daughter and they all need jobs. Three of them are involved in the business at the moment and I would hope that they will all find a place here if they want it. While there’s always a certain element of risk inherent in R&D, Martin points out that he doesn’t pursue products or ideas unless he is confident that there is a niche for them: “As I’ve worked in milling, screening and separating all my life, it’s a market I’m extremely familiar with and I’d have a good insight into what’s missing in that market,” he concludes.